Hi, I’m Cindy and this is the imperfect story about how I became debt-free. We made mistakes and learned a lot. Most importantly, we just didn’t quit. 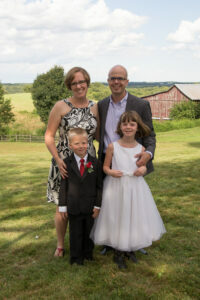 My husband, Brad, and I have been married since 2002, after both graduating with our bachelor’s degrees. Thankfully, I graduated with no debt thanks to scholarships and my parents’ generous support. My husband graduated with around $20,000 in student loans. When we began our new life together, we started doing all the things you’re “supposed” to do. We bought a brand new car in 2003, 100% financed. 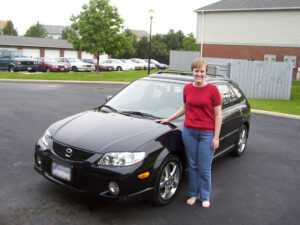 In 2004, we bought a 2nd car, also 100% financed. We bought our first home in 2004, 97% financed. During that same time, I went to graduate school for a master’s degree in library and information science. Thankfully, we only financed about $10,000 of that and paid cash for the rest. 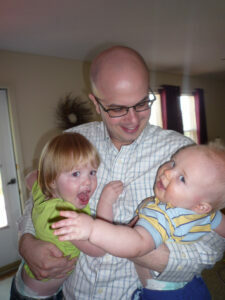 We also started trying to have a baby, which marked the beginning of our long battle with infertility. We were also living on one modest salary. We were left with very little money after paying the bills each month. Thankfully, we had managed to avoid racking up credit card debt over the years, which would have made the situation even worse. With only about $1,000 of savings in the bank, we knew that a large home repair or medical bill could easily send us over the financial cliff. We needed to make a plan if we were going to survive long-term on one income. What does a gal with a library science degree do to solve a problem? She researches! And reads! A lot! I read a lot of great personal finance books and they all seemed to recommend the same advice: save money for a rainy day, pay off debt, save for retirement, save for kids’ college expenses, and invest your money in stocks, real estate, or businesses. These all seemed like great things, but HOW was I supposed to do that when we barely had any money left after paying our bills? We realized we were never going to make any financial progress when most of our money was going towards debt payments every month. We had to tackle our debt first. Step one was to get rid of the car loans. We sold both of our cars within 2 months and used the small profits and whatever savings we could scrape together to buy two much older cars. I drove around in an 11-year-old minivan with a questionable electrical system that we bought for $2,200. It wasn’t pretty, but it was such a relief not to have car payments anymore! I think some of our friends and family thought we were crazy. We were making some serious progress on our finances and then life threw us a little surprise. Another baby was on the way when our first was only 9 months old! After our long battle with infertility, we never expected that! Our small “starter home” was already feeling quite cramped and we weren’t sure where we’d fit another person. 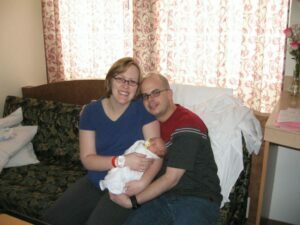 We could have managed in our small home, but we decided we’d rather move to a bigger house before the new baby arrived. It was now late 2008, in the midst of the global financial crisis. The housing market was the worst anyone had seen in decades and we were gearing up to sell a house and buy a new one. Our realtor told us to expect it to take 6 months or more to sell our little house and not to get excited about shopping for a new one yet. Much to our surprise, we had two competing offers for the house within 3 weeks in January 2009! Lesson: Well-maintained, inexpensive houses in good school districts ALWAYS have a market. Thankfully, we found a new house that we loved and we were able to move just after our daughter’s first birthday. The crazy thing is that now, houses in our neighborhood sell very quickly for MUCH more than what we paid. When we bought it, our new house had been sitting on the market for over 6 months. We had no idea what a deal we had found! The year 2009 was taken up with mostly settling into our new house, continuing to pay off student loans, and welcoming our new baby boy. Over the next few years, we got a little lost in the crazy routine that is life with multiple little ones in the house. Diaper, eat, play, sleep, repeat. While life continued on, we kept plugging away at the student loans, using our own combo of the debt snowball method and avalanche method. We had most of the student loans paid off within a year. In 2010, my cheap old van died. Since we didn’t have much in the way of savings, we ended up taking out a car loan for a replacement, vowing to pay it off as quickly as possible. In late 2012, Brad’s older car unexpectedly died in a dramatic electrical fire. Smoke billowing out a dashboard is a little scary! So we had another car purchase… and another unfortunate car loan. Even though we had some bad luck, we did our best to stay focused on our goals. We also had plenty of fortunate things happen along the way. Brad’s career blossomed and he got promoted, which came with a large pay raise. We did not change our lifestyle at all and used the extra money to pay off debt. With his promotion, his company also offered to help him pay for the costs of getting an MBA. In late 2013, he started graduate school and finished in late 2014. We were able to pay our portion with cash so there were no new student loans. After paying off one of the two new car loans, we decided to deviate from the original plan and stop paying extra on debt. We wanted to build a much larger emergency fund. That way, we could avoid ending up back in debt even if ANOTHER car died or some other large expense came along. We set a goal of setting aside enough money in the bank to cover 6 months of living expenses in case of job loss or medical emergency. It would also be enough to buy a car with cash if the need arose. We completed the emergency fund in early 2015 and moved full-steam ahead with paying off the final car loan. In January 2016, we paid off that final loan! We are now completely DEBT-FREE besides our mortgage and we have a 6-month emergency fund in the bank. We are making progress paying off our mortgage, have a solid plan for retirement, and have modest savings for our kids’ college. We’re planning on mostly paying cash as we go for their college expenses since our personal expenses should be so low at that time. We should also be able to add a second income since there will be no need for a stay-at-home parent. We are also preparing for future car purchases by consistently putting money into a car savings account. It took us about 7.5 years to reach our goal of being debt free, but in that time we also lived on one income, bought a bigger house, had a second baby, had 2 cars die prematurely, completed a graduate degree, and even went to Walt Disney World (paid in cash). I feel like often debt-free stories are perfect tales with no bumps in the road and quick timelines. Our story is a little longer and bumpier, but we did a lot of living in that time too. I created this blog because I wanted to share some of the things we’ve learned along the way. I hope you find some useful things here that help you along in your journey toward financial freedom. If nothing else, I hope you feel less alone in your journey. If you’d like to keep up with updates to this blog, subscribe to my newsletter.